The Art for Sunderland Exhibition is designed to give an idea of what goes on behind the scenes in a museum. I was lucky enough to get to choose a painting to work on in gallery. 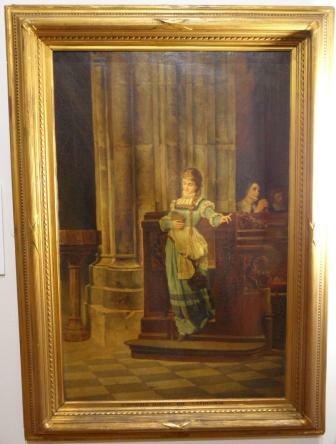 I chose ‘Marguerite Leaving the Cathedral’ a beautiful 19th C painting in a pre-Raphaelite style. 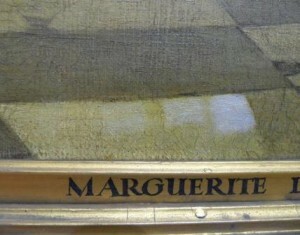 It wasn’t just that I liked the painting it was because she was SO DIRTY! I knew that if I could get the dirt and discoloured varnish off of her she would look stunning. First I tested to see how much dirt I could get off and with what. 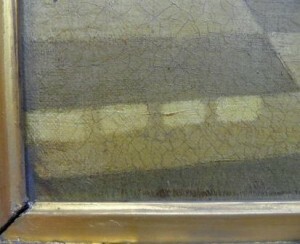 Below is a picture of the cleaning tests – the swabs came off black! 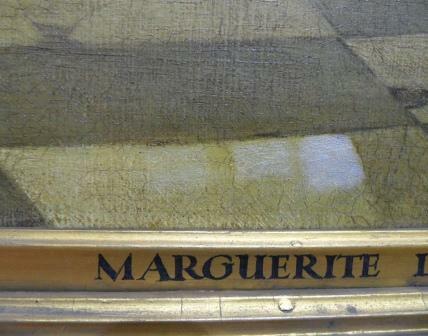 I think we can safely say that marguerite was a very dirty girl and had been avoiding a clean for at least 100 years. 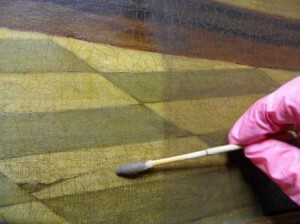 The dirt coming off was probably from the time when she was displayed in rooms with open fires and gas lights creating lots of soot on the surface which will also be quite acidic so it’s definitely a good idea to get it off. In the second tests I tried different ways of getting the varnish off as it seemed very yellow (actually it looked more like brown toffee) you can see in the last test on the right how different the colours will look when it is removed. in the bottom picture you can see what it looks like as I begin to clean off the dirt. I will be working in Sunderland Gallery on and off for the next few months so come and see how I am getting on.